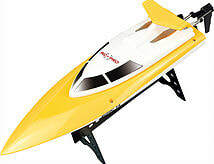 * R/C BOATS - Express Hobbies Inc.
Our new SONIC 14 High-Speed brushed boat is a perfect beginner model for all ages. It is easy to run and has all the features you want and need from a boat. This 14" category model comes with a speed of about 20 km/hour, a long range 2.4G radio system and a self-righting feature which make it a model anybody would have fun playing with in a lake or on the beach. Our new SONIC 19 High-Speed brushed boat is packed with fun and has all the features you want and need from a boat. 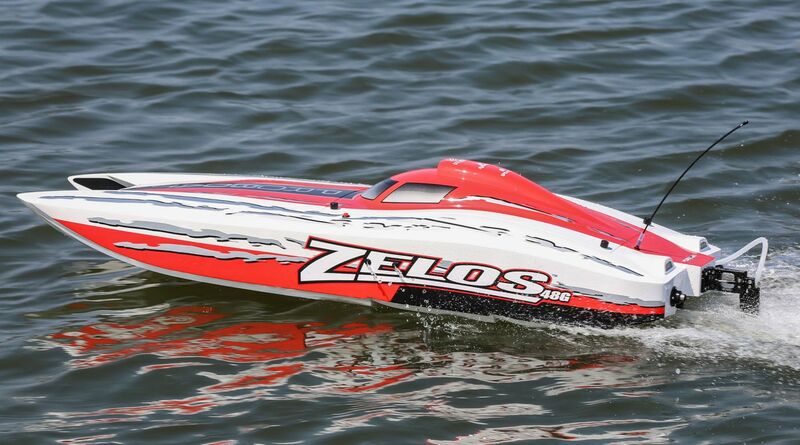 This 19" category model comes with a speed of about 30 km/hour, a long range 2.4G radio system and a self-righting feature guarantees anybody would have fun playing with this boat in a lake or on the beach. 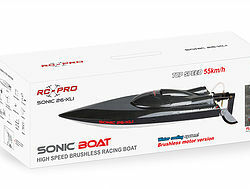 The SONIC 26-XLI High-Speed brushless boat is an absolute monster featuring a blazing 2822kv motor which brings this model boat to an amazing speed of over 55kmh. It includes all the features you want and need from a boat with a long range 2.4G radio system and a self-righting feature. The Racent® COMPASS 650mm sailboat provides entry-level sailboating enthusiasts with the perfect model when entering the hobby. The COMPASS comes 95% prebuilt, requiring little preparation time to hit the water. ​Don’t let the small size fool you, with features like a mini-sail winch servo and a 2.4GHz radio system allowing enthusiasts to easily and affordably get into the hobby. ​The sailboat’s intricately-designed hull is made from blow-molded ABS plastic for added strength, durability and great looks. The model’s small size provides ease of use, allows users to run the model in fairly small bodies of water and makes transporting the model easy. 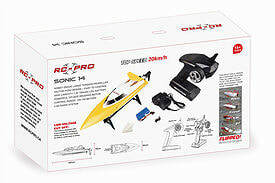 ​The boat comes pre-rigged and -assembled with the only requirement of the user being to install the 4 AA receiver batteries and 4 AA transmitter batteries (not included). In less than 5 minutes you’ll be ready to hit the water and begin your journey into the serene world of RC sailboating. Perhaps the most impressive feature of this sailboat is the size - measuring over 7' (213cm) tall from the bottom of the ballast bulb to the tip of the mast. The Eclipse 1M is an RTR boat, and arrives with everything required to start sailing. In addition to the pre-trimmed and decorated hull, inside you'll find a 2.4GHz radio system, rip-stop nylon sails and all the rigging parts necessary to easily build the mast. The Eclipse even includes a Li-ion receiver battery with USB charger, AA batteries for the transmitter, and a lightweight boat stand for display and maintenance. Best of all, the Eclipse is quickly and easily dismantled for storage and transportation. 1. Equipped with 35A super power two-way Electronic speed controller,2815-35000 KV brushless motor and 11.1V 1800Mah 25c lithium polymer battery,FT012 is super power and flexible fast, top speed can reach over 45 km/h. 2. Flip over automatically and quickly when the boat is capsized, easy to operate. 3. 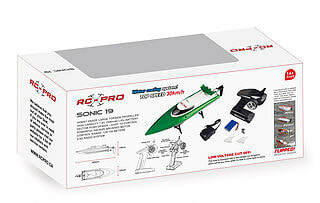 With water-cooling system motor and electronic speed controller, excellent cooling down performance,make the boat more stable in a longer racing period. 4. Highly effective 3 in 1 Electronic Speed Controller, with 2.4G receiver,electron speed regulator and servo controller. 5. Electronic Speed Control system has been designed with protection to avoid damage from overcurrent,overvoltage,Low voltage,motor blocked,etc. 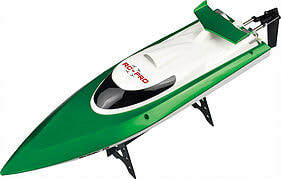 Recoil R/C boat. Ready to run ! !